Want to please a crowd? You can't lose with these no-bake Winner's Circle Treats topped with caramel, marshmallows, chocolate and nuts. Place graham squares, side by side, in single layer in ungreased 15x10x1-inch baking pan. Microwave caramels and water in microwavable bowl on HIGH 2 to 3 minutes or until caramels are completely melted, stirring after each minute. 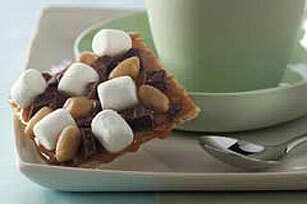 Pour over grahams; spread to evenly cover graham squares. Sprinkle immediately with marshmallows, chocolate and peanuts; press gently into caramel mixture with back of spoon to secure. Cool completely. Cut into 24 squares to serve. Wrap individual portions of this tasty treat in plastic wrap to take with you on race day! Makes 24 servings, 1 square each.